petWALK pet doors use RFID technology for contactless access control. But what is it and how does it work? In this post we try to answer this and many other related questions. The abbreviation RFID stays for radio-frequency identification, which means identification by electromagnetic waves". RFID enables the automatic identification and localization of objects and living beings. An RFID system consists of a transponder, the microchip which is located on or in the object or living organisms, and includes an identifying code and a reader for reading this code. The micro chipp in your pet is a tiny implant, about the size of a grain of rice, which your vet injected painlessly under the skin. How does RFID work at petWALK? Once the petWALK pet door recognizes your cat or dog and access control is enabled, the built-in RFID reader is turned on and the RFID antenna is activated in the middle of the door leaf. The microchip in or on your cat or dog has no battery, but is powered by the antenna in the petWALK petflap with energy. Once the chip receives enough energy, it starts transmitting his identification as a radio station on a certain frequency. The petWALK animal door is listening now for about 10 seconds (orange flashing lock icon) on that frequency, and once it detects a known chip, opens the door. The following video explains how to activate and setup the RFID access control. The petWALK pet door is compatible with all standard animal identification chips in accordance with the ISO standard 11784/11785 FDX-B. However, this technology dates back from the 70s and has been standardized almost 20 years ago (1996). It is hopelessly outdated and has a number of annoying limitations. Nevertheless it is normally enough to use such implanted chips as a key for the petWALK flap. However, as a pet door manufacturer we have no influence on the quality of the transponder in your cat or dog and therefore can't give any warranties with respect to the function or range. We therefore recommend to test with your own pets if detection range is sufficient before installation. Shouldn't it be possible to learn the tag or the distance too limited, it is not a malfunction of the device, but a technical limitation of the ID chips. How far is the detection range? 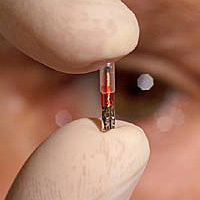 The typical reading distance of well-tuned implanted chips is approximately 10 cm up to 20 cm. The included small colar tags should provide a reading distance of at least 15-25 cm, the big transponders at least 20-30 cm. In learning mode, the distance usually is half the normal reading distance. The actual achievable range is dependent on many factors. The biggest challenges are the power supply of the transponder, the transmission frequency and the position of the transponder towards the antenna. On the first point, there are legal provisions, how much energy is allowed to be sent by the antenna without interfering with other electronic devices EMV standard). Depending on the quality of the chip in or on your pet it needs more or less energy to activate itself. If it needs more energy it need to get nearer to the antenna. The principle is called inductive coupling. The distance between the two coils is the wireless transmission link and should be minimized. The greater the distance of the two coils the flux leakage is massively increased, so that the inductive coupling is reduced and the efficiency deteriorates. Typical distances, which can be bridged by this method are approximately the coil diameter up to twice the coil diameter. The coil diameter of the transponder in your pet is only a few millimeters, so the theoretically achievable distance is also limited to a few centimeters. This is also the reason why the much larger compared collar tag works so much better. The second challenge is the correct transmission frequency. Although this is defined in the standard and the petWALK pet door adheres very closely to it (it is adjusted daily). But specially implanted chips often exhibit considerable variation, which means that they do not send on the agreed frequency. One can imagine as if you were listening to a radio program with a mistuned radio. There is noise and you can hardly hear anything. Only when the signal becomes stronger, which means your pet gets closer to the antenna, one can recognize the data. The third factor is the position of the transponder in the electromagnetic field. This means, as the chip that looks like a grain of rice, is aligned with the antenna in the door leaf. It works best when it stands normal to the door leaf and very poor when he is in a parallel position. This has physical reasons (magnetic field of coil) through the construction of the implanted transponder. This fact has a dramatic impact on the read range of works great not to. To maximize the reach petWALK doe not read the numerical value of the chips, but analyzes the frequency spectrum of the chip by means of complex mathematical methods and compares it with previously stored patterns. The range of the chip can not be changed on the door. What should you look for when implanting? Typically, an identification chip is implanted by a veterinarian into the left neck. For use with a petWALK pet door it would be beneficial if this were as far forward as possible closely behind the ear. It is also helpful if the veterinarian injects the chip in a way that it lies horizontally. That way the chip can absorb most of the energy and can start sending earlier. We recommend to test the microchip prior to implantation at our door. It should be noted that the chip is in the syringe very well shielded by the metal needle. If, however, the syringe with the tip forward moved toward the door leaf, the chip should be able to be detected in 3-5 cm distance. If successful, the chip will work in the animal body before our pet door. Of course, you pet might still have to practice a bit to get to the appropriate part of the body as close as possible to the door. Usually your pets are quite smart and learn very quickly. The range depends on the quality of the transponder. Usually transponder from brand manufacturers such as by Virbac of "Back Home Biotec" work very well.